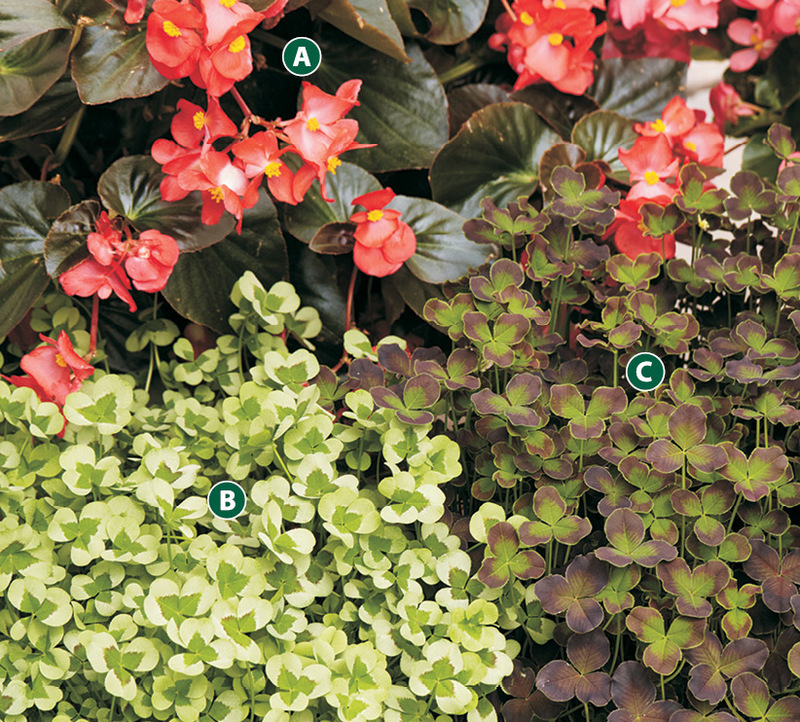 Revive your shade garden with contrast and color with these beautiful plant combinations! The shade is a natural place of respite— cool, relaxing, peaceful. But, do you ever collapse into the coolness of your shade garden only to find the sights uninspiring or the maintenance list unending? Choosing easy-to-grow plants with energy and interest makes all the difference. With a little thinking outside the box, you can retreat to an area that rekindles inspiration and leaves you feeling rejuvenated. The key to establishing a vibrant shade garden is to use contrast in many ways with light, color and texture. Even without the sun, you can make your shade shine by using bright plants, such as the stunning yellow and green shell ginger above, or the charming ‘Leonore’ trifolium below. Be creative by choosing atypical plants for the shade, such as tropicals. And because the flowers on many shade plants are insignificant, look to the foliage for color. Play with leaf sizes and heights of plants to add depth and movement. You will not be short of interesting sights to ponder, and soon your shade garden — big or small — can be your greatest muse. 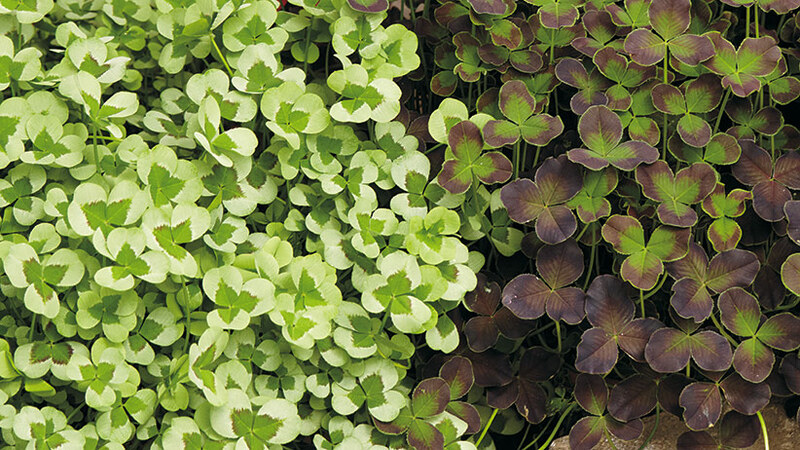 The maroon hues of ‘Debbie’ trifolium and the bronze leaves of ‘Whopper Red with Bronze Leaf’ begonia contrast with the limegreen foliage of ‘Leonore’ trifolium, which shout s as the center of attention. The trifoliums bloom briefly in spring, but the foliage is the main event and the consistent bright red begonia blossoms are a trusty companion; you can depend on this look from spring through fall. This three-piece combo is great repeated along the edge of a pathway or in a container on your shaded patio, where the trifolium will trail over the edge. To keep trifolium sprightly, allow the soil to dry out between watering, fertilize twice a month, and be sure that they are greeted with some morning sun, as all of these plants love the sun as much as the shade. Take a bow, shell ginger! The best way to build off of the excitement of this unique plant is to add plants that are nothing like it. 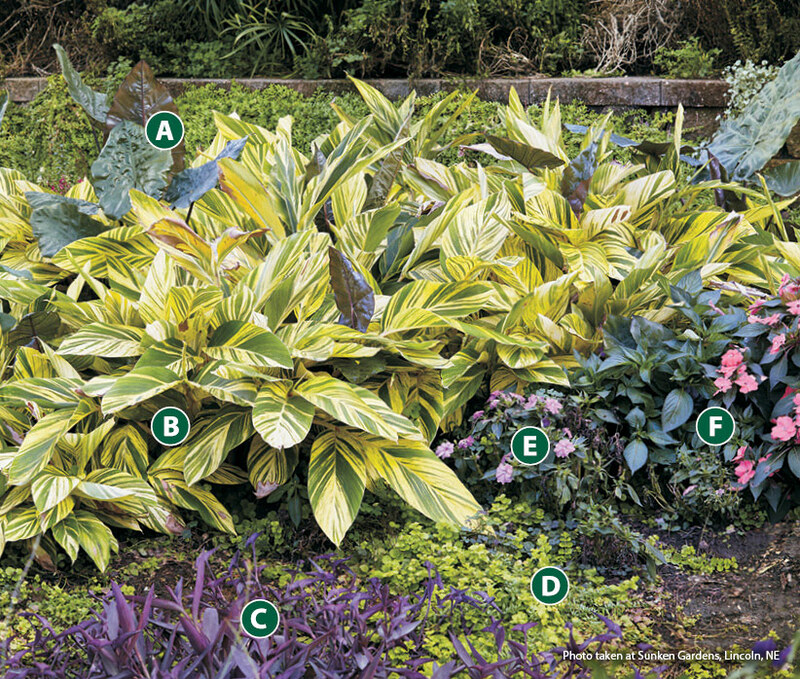 Plants of opposite color, like the purple shades of impatiens, purple heart and elephant ear, pleasantly interrupt the mass of variegated green. The elephant ear looms, and creeping Jenny crawls for playful height difference, but they also offer a needed cohesiveness as they spread alongside the ginger. Depending on amounts of shade, the elephant ears will grow even larger; the more shade, the bigger the leaves. Where they are hardy they will grow taller— sometimes 12 to 15 feet —but in colder climates, where the rhizomes of the ginger and elephant ear are dug up and stored inside for winter, they stay around 6 to 8 feet tall. The impatiens bloom spring through fall, so this colorful sight will always greet you. Even though their differences are attractive, these plants do share important commonalities: part shade, well-drained soil and consistent moisture.